Azure App Service provides a highly scalable, self-patching web hosting service. 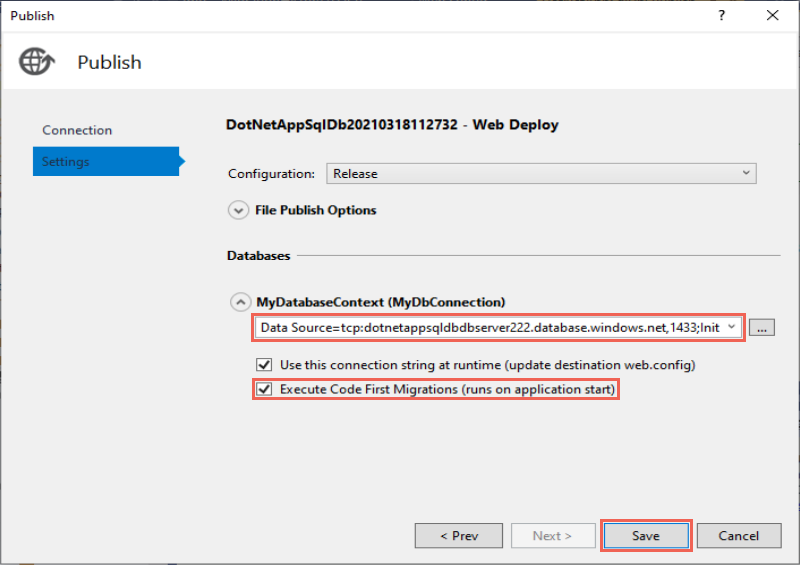 This tutorial shows you how to deploy a data-driven ASP.NET app in App Service and connect it to Azure SQL Database. When you're finished, you have an ASP.NET app running in Azure and connected to SQL Database. Install Visual Studio 2017 with the ASP.NET and web development workload. If you've installed Visual Studio already, add the workloads in Visual Studio by clicking Tools > Get Tools and Features. Extract (unzip) the dotnet-sqldb-tutorial-master.zip file. The sample project contains a basic ASP.NET MVC create-read-update-delete (CRUD) app using Entity Framework Code First. Open the dotnet-sqldb-tutorial-master/DotNetAppSqlDb.sln file in Visual Studio. Type Ctrl+F5 to run the app without debugging. The app is displayed in your default browser. Select the Create New link and create a couple to-do items. Test the Edit, Details, and Delete links. The app uses a database context to connect with the database. In this sample, the database context uses a connection string named MyDbConnection. The connection string is set in the Web.config file and referenced in the Models/MyDatabaseContext.cs file. 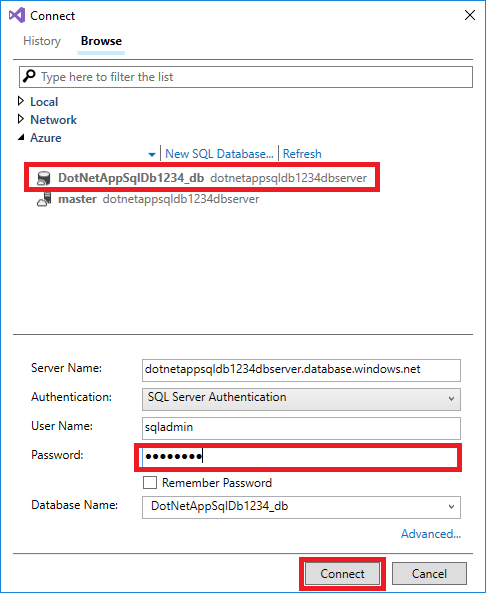 The connection string name is used later in the tutorial to connect the Azure app to an Azure SQL Database. 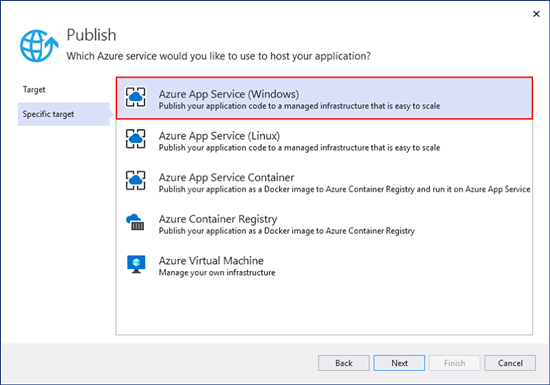 Make sure that Microsoft Azure App Service is selected and click Publish. 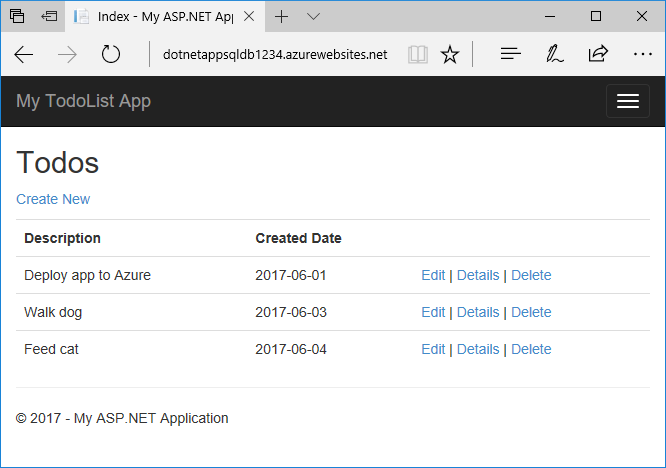 Publishing opens the Create App Service dialog, which helps you create all the Azure resources you need to run your ASP.NET app in Azure. 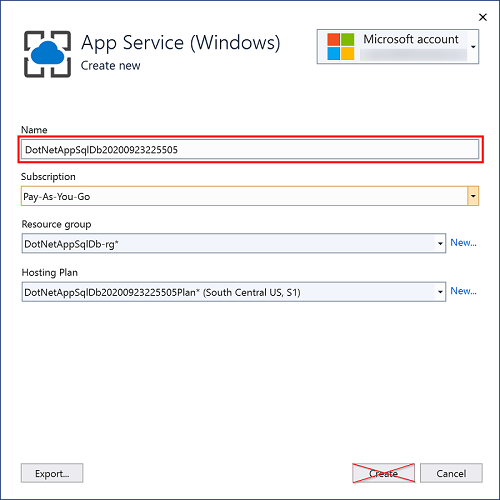 In the Create App Service dialog, click Add an account, and then sign in to your Azure subscription. If you're already signed into a Microsoft account, make sure that account holds your Azure subscription. If the signed-in Microsoft account doesn't have your Azure subscription, click it to add the correct account. You can keep the generated web app name, or change it to another unique name (valid characters are a-z, 0-9, and -). The web app name is used as part of the default URL for your app (<app_name>.azurewebsites.net, where <app_name> is your web app name). 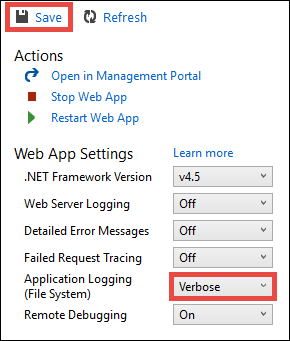 The web app name needs to be unique across all apps in Azure. Next to Resource Group, click New. Name the resource group myResourceGroup. Next to App Service Plan, click New. 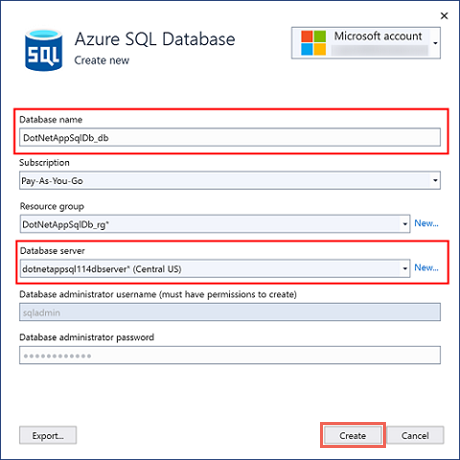 Before creating a database, you need an Azure SQL Database logical server. A logical server contains a group of databases managed as a group. Click Create a SQL Database. 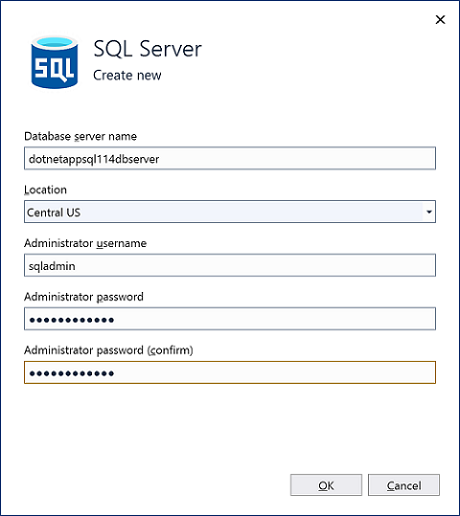 In the Configure SQL Database dialog, click New next to SQL Server. A unique server name is generated. This name is used as part of the default URL for your logical server, <server_name>.database.windows.net. It must be unique across all logical server instances in Azure. You can change the server name, but for this tutorial, keep the generated value. Add an administrator username and password. For password complexity requirements, see Password Policy. Remember this username and password. You need them to manage the logical server instance later. Even though your password in the connection strings is masked (in Visual Studio and also in App Service), the fact that it's maintained somewhere adds to the attack surface of your app. App Service can use managed service identities to eliminate this risk by removing the need to maintain secrets in your code or app configuration at all. For more information, see Next steps. Click OK. Don't close the Configure SQL Database dialog yet. Keep the default generated Database Name. In Connection String Name, type MyDbConnection. This name must match the connection string that is referenced in Models/MyDatabaseContext.cs. The Create App Service dialog shows the resources you've configured. Click Create. 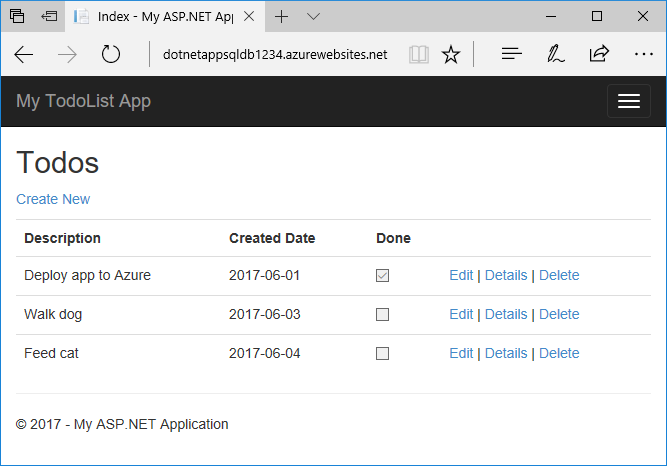 Once the wizard finishes creating the Azure resources, it publishes your ASP.NET app to Azure. Your default browser is launched with the URL to the deployed app. Add a few to-do items. Congratulations! 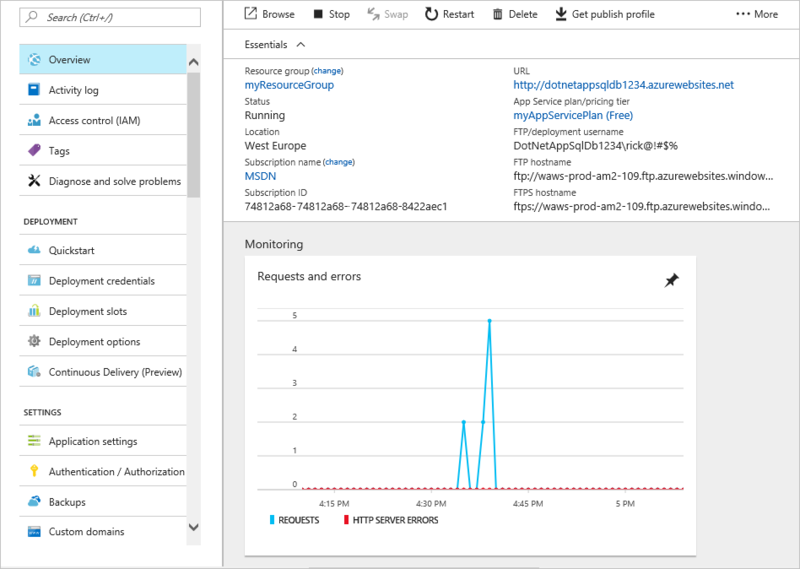 Your data-driven ASP.NET application is running live in Azure App Service. Visual Studio lets you explore and manage your new SQL Database easily in the SQL Server Object Explorer. 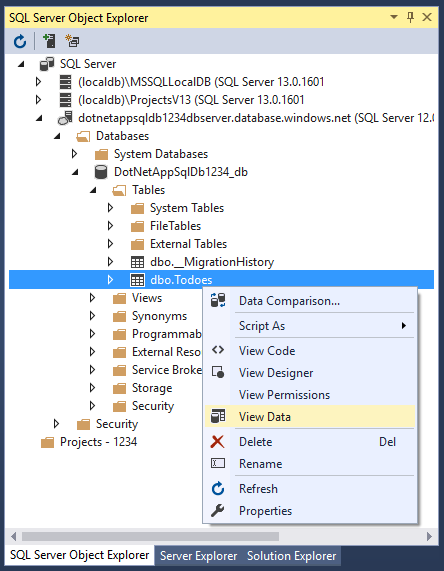 From the View menu, select SQL Server Object Explorer. At the top of SQL Server Object Explorer, click the Add SQL Server button. 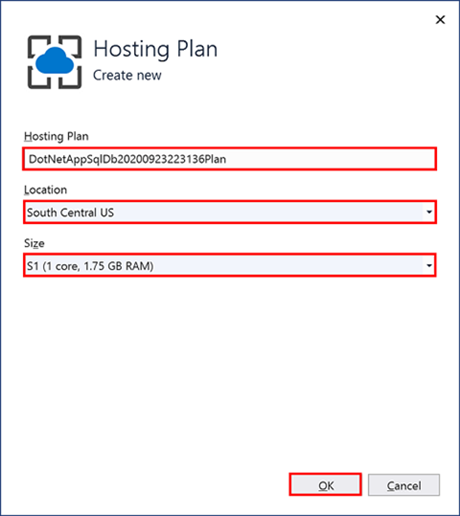 In the Connect dialog, expand the Azure node. All your SQL Database instances in Azure are listed here. Select the SQL Database that you created earlier. The connection you created earlier is automatically filled at the bottom. Type the database administrator password you created earlier and click Connect. The Create a new firewall rule dialog is opened. 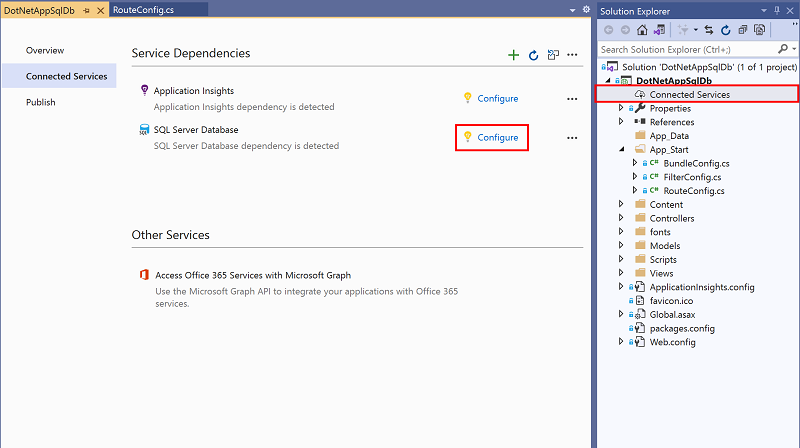 By default, your SQL Database instance only allows connections from Azure services, such as your Azure app. To connect to your database, create a firewall rule in the SQL Database instance. The firewall rule allows the public IP address of your local computer. The dialog is already filled with your computer's public IP address. Make sure that Add my client IP is selected and click OK.
Once Visual Studio finishes creating the firewall setting for your SQL Database instance, your connection shows up in SQL Server Object Explorer. Here, you can perform the most common database operations, such as run queries, create views and stored procedures, and more. Expand your connection > Databases > <your database> > Tables. Right-click on the Todoes table and select View Data. You can use the familiar tools in Visual Studio to update your database and app in Azure. In this step, you use Code First Migrations in Entity Framework to make a change to your database schema and publish it to Azure. For more information about using Entity Framework Code First Migrations, see Getting Started with Entity Framework 6 Code First using MVC 5. Run a few commands to make updates to your local database. From the Tools menu, click NuGet Package Manager > Package Manager Console. Type Ctrl+F5 to run the app. Test the edit, details, and create links. If the application loads without errors, then Code First Migrations has succeeded. However, your page still looks the same because your application logic is not using this new property yet. Make some changes in your code to use the Done property. For simplicity in this tutorial, you're only going to change the Index and Create views to see the property in action. That's all you need to see the changes in the Index and Create views. Type Ctrl+F5 to run the app. You can now add a to-do item and check Done. Then it should show up in your homepage as a completed item. Remember that the Edit view doesn't show the Done field, because you didn't change the Edit view. Now that your code change works, including database migration, you publish it to your Azure app and update your SQL Database with Code First Migrations too. Just like before, right-click your project and select Publish. Click Configure to open the publish settings. Make sure that the connection string for your SQL Database is populated in MyDatabaseContext (MyDbConnection). You may need to select the myToDoAppDb database from the dropdown. Select Execute Code First Migrations (runs on application start), then click Save. 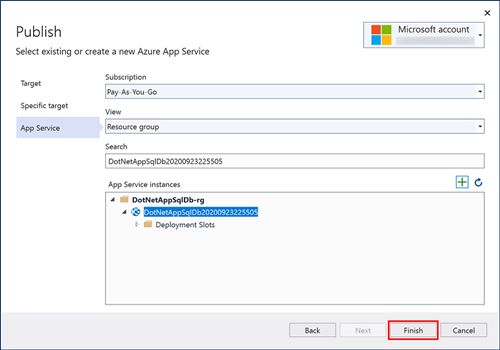 Now that you enabled Code First Migrations in your Azure app, publish your code changes. In the publish page, click Publish. Try adding to-do items again and select Done, and they should show up in your homepage as a completed item. All your existing to-do items are still displayed. When you republish your ASP.NET application, existing data in your SQL Database is not lost. Also, Code First Migrations only changes the data schema and leaves your existing data intact. You can stream tracing messages directly from your Azure app to Visual Studio. Each action starts with a Trace.WriteLine() method. 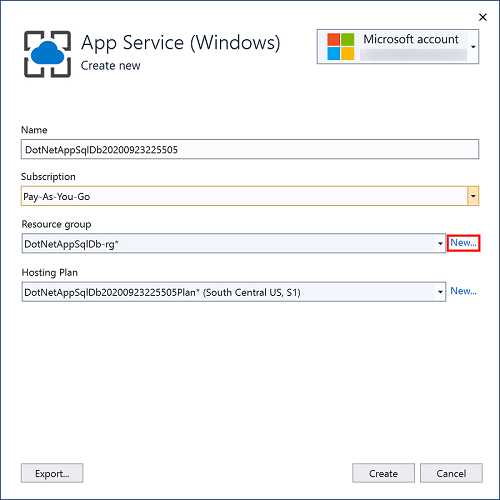 This code is added to show you how to add trace messages to your Azure app. From the View menu, select Server Explorer. 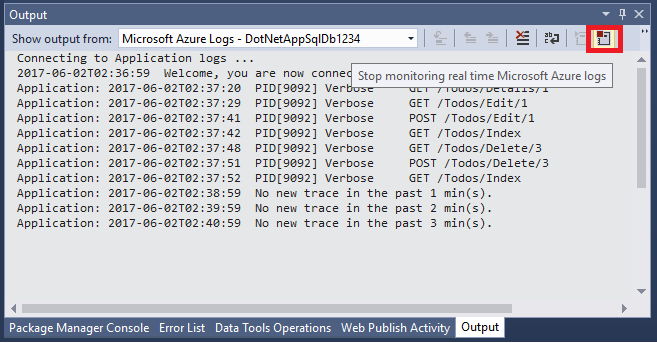 You can configure logging for your Azure app in Server Explorer. In Server Explorer, expand Azure > App Service. 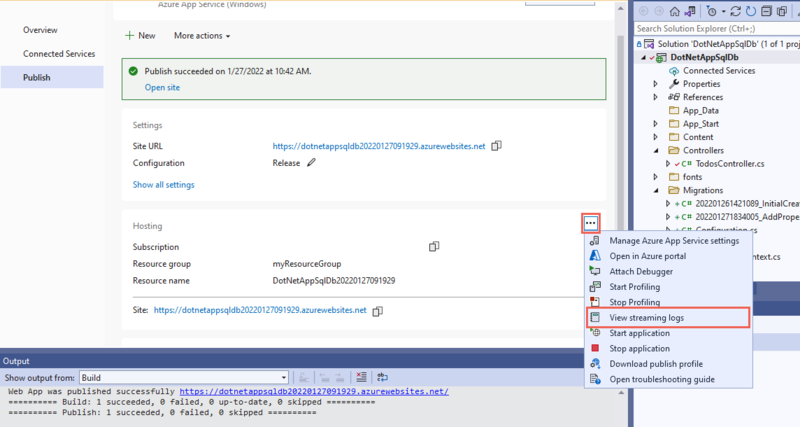 Expand the myResourceGroup resource group, you created when you first created the Azure app. Right-click your Azure app and select View Streaming Logs. The logs are now streamed into the Output window. However, you don't see any of the trace messages yet. That's because when you first select View Streaming Logs, your Azure app sets the trace level to Error, which only logs error events (with the Trace.TraceError() method). To change the trace levels to output other trace messages, go back to Server Explorer. 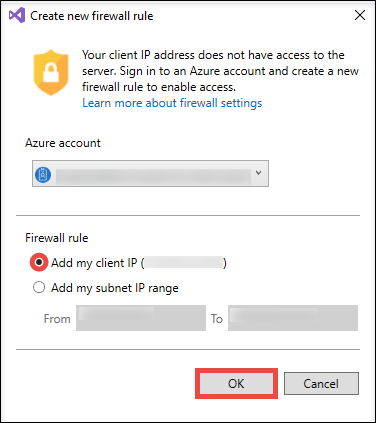 Right-click your Azure app again and select View Settings. In the Application Logging (File System) dropdown, select Verbose. Click Save. You can experiment with different trace levels to see what types of messages are displayed for each level. For example, the Information level includes all logs created by Trace.TraceInformation(), Trace.TraceWarning(), and Trace.TraceError(), but not logs created by Trace.WriteLine(). 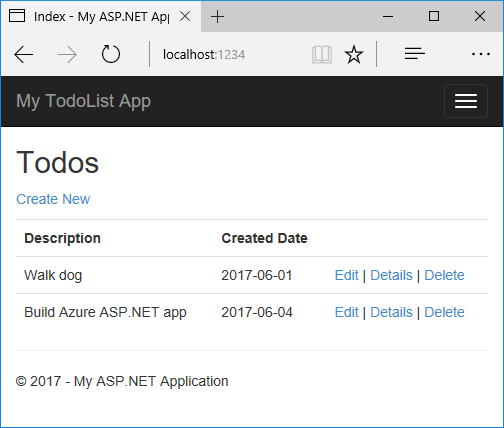 In your browser navigate to your app again at http://<your app name>.azurewebsites.net, then try clicking around the to-do list application in Azure. The trace messages are now streamed to the Output window in Visual Studio. To stop the log-streaming service, click the Stop monitoring button in the Output window. Go to the Azure portal to see the app you created. 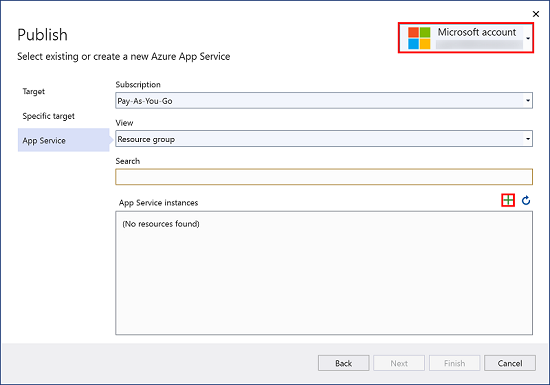 From the left menu, click App Service, then click the name of your Azure app. You have landed in your app's page. By default, the portal shows the Overview page. This page gives you a view of how your app is doing. Here, you can also perform basic management tasks like browse, stop, start, restart, and delete. The tabs on the left side of the page show the different configuration pages you can open. From your web app's Overview page in the Azure portal, select the myResourceGroup link under Resource group. Advance to the next tutorial to learn how to easily improve the security of your connection Azure SQL Database.